You know it’s the holiday season when "A Christmas Story” Comes Home is all set up in the Indiana Welcome Center in Hammond. If you have never been to this spectacular display, then you don’t yet know what you’re missing! This exhibit is completely free and is open from November 10 - December 31, 2018. This exhibit is centered on the popular movie - I am sure you have seen once, twice, or more than 20 times - “A Christmas Story.” The various Macy’s window displays showcase the fictional town of Hohman which is really low and behold, the author (and movie narrator) Jean Shepherd’s hometown, Hammond, Indiana! A peek at one of the window displays you&apos;ll find in the exhibit. You can’t have Christmas without the jolly man in the red suit. Santa will be visiting our exhibit every weekend from Thanksgiving to Christmas! He will be sitting atop a replica of Santa’s Mountain from the movie, complete with a red slide and a pillow of snow for the little ones. No worries, Santa isn’t shy, kiddos are welcome to get their pictures taken with Santa too! Santa will also visit on special days leading to Christmas – check the full schedule to plan your day with Santa. If you have furry friends that have been looking forward to meeting Santa, look no further! On Wag-Your-Tail-Wednesday’s November 21 and 28 and December 12 and 19, 2018, you can bring your pets in for photos with Santa between 4:00 and 7:00 PM! See Santa&apos;s full schedule HERE. Many of us have seen “A Christmas Story” more than a dozen times. It’s iconic, it’s a tradition, and it plays for 24 hours leading up to Christmas. The Indiana Welcome Center transforms into our very own Cleveland Street, depicting scenes from the movie. Six scenes will have you reliving the movie as you stroll through the exhibit. Higbee&apos;s Department Store – Ralphie Parker and his friends gaze at the holiday window display that showcases the must-have toys for Christmas. A Hero&apos;s Dream – Ralphie dreams of saving the family from Black Bart and his gang of villains with his trusty Red Ryder in hand. Flick&apos;s Tongue and the Tripe Dog Dare - Flick exclaims “Stuck, Stuck, Stuck!” after Schwartz triple dog dares him to stick his tongue to the frozen flagpole. Firemen and police officers help Ms. Shields retrieve Flick. A Major Award – The Old Man shows off his major award in the front window of the Parker home. The glowing leg lamp was his “Major Award” after winning a contest. The Bumpus Hounds – The hillbilly neighbors’ dogs destroy the Parker’s Christmas dinner. Leaving the family with no turkey, no turkey sandwiches, no turkey salad, and no turkey hash. As tradition, this is the kick off to the holiday season! A Major Event as well as the holiday market is held from 11:00 AM to 4:00 PM. 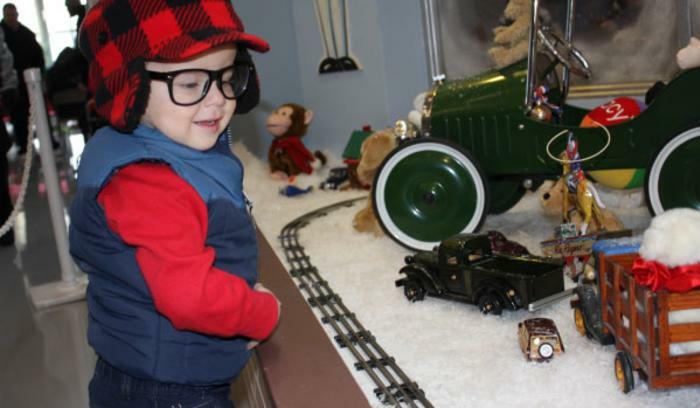 Kids can enjoy train rides, treats, the movie ‘A Christmas Story,” and visits with Santa himself. While parents can start their holiday shopping at the pop-up market that features local vendors selling specially crafted, and unique items. The Holiday Market also continues to Sunday, December 2, 2018 from 11:00 AM to 4:00 PM. This holiday event is exclusively for our first-responders (police, fire, EMS, Hoosier Helpers, and retired or active military) from 5:00 to 8:00 PM. Families can enjoy the exhibit, visit with Santa, and enjoy hot cocoa and cookies. First-responders are asked to show their IDs at the front desk upon arrival. From 10:00 AM to 1:00 PM Santa and holiday activities will be available on this sensory friendly and accessible day for kids and adults of all ages. Parent and child teams race the clock to “change a tire” and run through an obstacle course. Winners will receive special prizes, and of course bragging rights! This event will take place at 10:00 AM. Without using their hands, contestants scarf down mashed potatoes to see who can eat theirs the fastest. Prizes are given to winners in each category. This event will take place at 10:00 AM. Read more on the special events here. No house is complete without their very own leg lamp to display in their home! Pick up a leg lamp (desk or regular sized) and “A Christmas Story” themed items at the Gift Shop! There are also lots of other holiday items and trinkets sure to impress your loved ones! There is plenty to keep you busy at the Indiana Welcome Center. Visit achristmasstorycomeshome.com for more details. The Welcome Center is conveniently located off of I-80/94 & Kennedy Avenue South in Hammond; about 20 minutes from Chicago and 2 hours from Indianapolis.